Feng Shui: “a Chinese geomantic practice in which a structure or site is chosen or configured so as to harmonize with the spiritual forces that inhabit it; also: orientation, placement, or arrangement according to the precepts of feng shui”1 Your resume is the one tool that can determine whether you receive an interview that could lead to your dream job in veterinary medicine. What does that have to do with feng shui? Quite a lot. 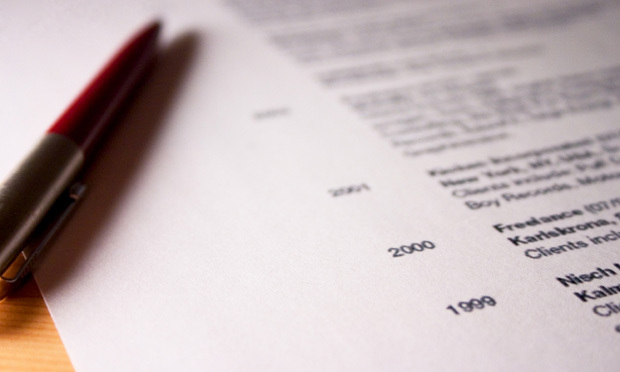 Your resume is the first impression you make on potential employers. A poorly planned and executed one is likely to see only the inside of a waste basket. A well-designed, well-considered resume, on the other hand, is likely to attract attention and result in an interview. What are you looking for in your dream job? Be specific. Mentoring (in which specific areas)? Working only with specific species? Expanding your knowledge in a specific area? What type of environment do you prefer? Fast-paced? Relaxed? Emergency? What kind of bond do you want to have with your clients? What type of life do you want to have? How much time do you want to work vs. family/play? Carefully think these questions through, because choosing a practice is just as important as a practice choosing you. Your answers will also influence how you present yourself as you work to enhance your resume's feng shui. Your resume should not tell your entire life story. Research shows that potential employers spend an average of 20–30 seconds2 reviewing your resume before deciding whether to extend an interview invitation; if you are lucky, you may have up to one full minute of their attention.3 Paid recruiters spend even less time—only 6 seconds on average.4 This means the information must be digestible to the reader and the important information must easily stand out. Your resume should be a succinct yet descriptive reflection of your skills, goals, and values. It should highlight your accomplishments, strengths, and interests, while demonstrating your proven abilities and hinting at your personality. The bottom line is that your name needs to readable from a distance of 5 feet. You want someone to be able to read your name off the paper on a desk when standing next to it. Make sure the type size you choose is big enough for someone to do just that. Have a friend test it. A watermarked footer on each page with your name also is a good idea so reviewers can remember which applicant they are reading about. This is where you should succinctly answer the questions you considered before you started working. A personal statement should be 2 to 3 sentences, highlight your unique skills or attributes, and include a brief summary of the type of employer or position you are seeking. This description is an easy way for you to screen positions that may not fit your career path by allowing employers to see quickly whether the skills you highlight are those they are looking for, and whether your values and goals fit the personality of the practice. Do not be afraid to be honest here; the sooner you or the employer decides that the position is not for you, the sooner you both can move on. Consistency. Always. Everywhere. Be consistent in how you write dates, abbreviate degrees earned, or place punctuation. Be especially consistent with verb tense—past or present is not as important as picking a tense and sticking with it. Consistency demonstrates attention to detail. For veterinary professionals, attention to detail is paramount. Ask friends and family to review your resume—the more eyes that look at it, the more likely you are to catch any errors. Balance between the black (type) and white (blank) spaces is an important part of resume feng shui, because a comfortable balance makes it more aesthetically pleasing. Try looking at each page of your resume from a distance, or using the “Print Preview” tool in your word processing software. Try formatting your resume multiple ways and printing the different designs to get a feel for how they look before you decide which to submit. Keep in mind that important information should stand out easily. To include references or not to include references? Consider putting a simple closing statement at the end of your resume that says “References available upon request.” This shows that you are willing to share references, while being respectful by not giving out those references’ email addresses or phone numbers to just anyone. And it should go without saying that you always ask permission before providing anyone’s name or contact information to potential employers. You also should tell those you name any time you plan to submit resume for positions, so they are not blindsided by a reference request. Your resume is a dynamic, living document and should be updated at least once, and preferably twice, a year—even if you are not looking for a job. Murphy’s Law says that when you find your dream job, you will—inevitably—not have looked at your resume in years, and the application deadline will be 5 p.m. that day. Keep a document on your desktop entitled “Resume Updates.” Any time you perform any professional activity, type a quick note in the document that includes the event, a description, and the date. This will help keep your memory sharp when you complete your scheduled semi-annual updates. Remember: the goal of the resume is not to get you the job; it is to land you the interview. 1. Merriam-Webster Dictionary: merriam-webster.com/dictionary/feng shui. 2. 7 Ways to a Winning CV. Talabi M—Hampshire, UK: Harriman House, 2011, pp xi. 3. Resumes Should be Precise and Punchy. MacFadden D—VancouverSun.com, PostMedia News (Jun 2011); http://www.vancouversun.com/entertainment/listings/Resumes+should+precise+punchy/4880875/story.html; accessed Mar 2014. 4. What Recruiters Look at During the 6 Seconds They Spend on Your Resume. Giang V—Businessinsider.com (Apr 2012); http://www.businessinsider.com/heres-what-recruiters-look-at-during-the-6-seconds-they-spend-on-your-resume-2012-4; accessed Mar 2014.